Once upon a time Hialeah Park was the most beautiful and famous thoroughbred racetrack in the world. People ventured to the sport’s showplace outside of Miami in Hialeah, Florida, not only for the races but also for what they called “The Hialeah experience.” The glamour, the celebrities, the prettiness, the bougainvilleas, the hibiscuses, the royal palms, the pink flamingoes, the food, the champagne, the thoroughbreds and, almost incidentally, the wagering. You went to Hialeah if you were famous, and rich; and if you were not, you went to rub elbows with the famous and the rich under the flamingo pink-and-green canopy that led into the clubhouse. Then, in the late 1980s and early ’90s, Hialeah fell on hard times. It struggled to survive until 2001, when it lost its thoroughbred racing license and faded to black. The track closed, the horses disappeared, and the crowds disbanded into memory like ghosts on the Titanic. The wooden stables rotted then were demolished. The royal palms began to die, their brown fronds littering the grounds. The ubiquitous bursts of pink and green gradually lost their zest. The concrete and coral clubhouse, with its winding stairs that bled the color of rust, decayed. 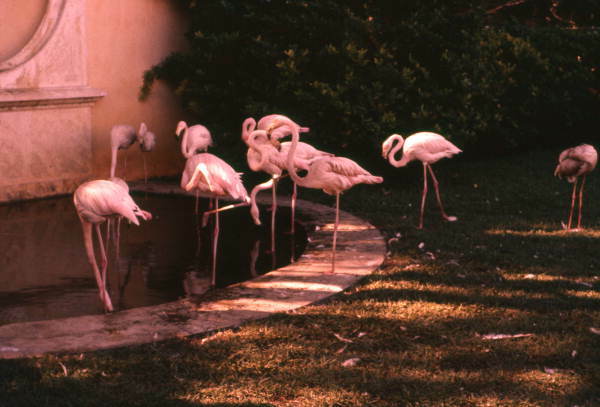 The flock of flamingoes nesting on the infield grass by the small lake grew pale, lean, lethargic. They had no reason to flutter up, as when a trumpeter used to play “The Flight of the Flamingoes,” sending them flapping around the track to herald the most famous race of all, the Flamingo Handicap. There were tales that Hialeah would be sold, torn down, and replaced by a shopping mall, or townhomes, or a casino. Or maybe not torn down, maybe just turned into a tourist attraction like the Queen Mary, tethered to a dock in Long Beach, California, where it could be gawked at by tourists while it rotted in the sun. But then. miraculously, in 2009–or maybe not so miraculously to some — Hialeah again was granted a horse racing license, but not for thoroughbred racing. Eight years after its demise, Hialeah reopened as a quarter horse racing track. Problem was, no one seemed to notice, at least not the people who counted, those who remembered Hialeah from the past. Quarter horse racing is to thoroughbred racing what drag racing a ’57 Chevy is to racing a Ferrari at Monaco. A low-rent distant cousin of profound embarrassment. I had last been to Hialeah for the Flamingo Handicap in the early ’90s. So this winter I decided to return to Hialeah, like an archeologist to a Mayan ruin, to excavate, pick through bits and pieces of its bones, to see if I could reconstruct the lost civilization that once flourished there and that was now, like the Old South, gone with the wind.